The sites you use every day are just 1 click away! WHAT IS MY "BROWSER HOMEPAGE"? Your browser HOMEPAGE is the page that you see every time you first start your Web browser (it's the same page you get taken to when you click on the button of your web browser marked "Home".) Often, this is the page belonging to your Internet Service Provider or to a search engine. However, you can change the settings of your web browser fairly easily so that ANY PAGE YOU LIKE opens when you click on the button marked "Home" - you don't have to stick with the default choice that your browser was installed with! 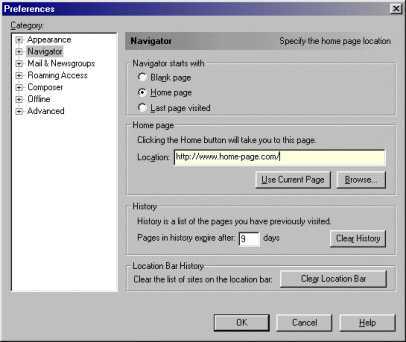 The way to change your browser homepage will depend on the Web browser that you are using. You can find out which browser you are using by selecting the "Help" drop-down menu at the top of your browser and choosing the "About" option. 4. Click on the "OK" button. You're DONE! 1. Choose the "Edit" drop-down menu and then choose "Preferences"
2. In the "Navigator" section (see picture below), click on the radio button (the little white circle) in front of the "Navigator starts with... Home page" option. Note that the "Navigator" section may look a little different from the picture if you're using Netscape 6.x as the picture is from Netscape 4.x. Copyright Genki Productions 2002. All Rights Reserved.